United States forward BILL CHRISTIAN shoots the puck past Soviet Union goalkeeper NIKOLAI PUSHKOV with five minutes remaining in the third period for the winning goal in the American's 3-2 upset victory over the USSR at the 1960 Winter Olympic Games at Squaw Valley, California. In front of a jampacked crowd at open-air Blyth Arena in Squaw Valley as well as a national television audience on a Saturday afternoon, 19-year-old TOMMY WILLIAMS picks up a loose puck to the left of USSR goaltender NIKOLAI PUCHKOV. The youngest of the American squad and the only Squaw Valley U.S.A. Olympian to claim a future regular National Hockey League place circles and starts along the boards behind the Soviet net. Confronted by a defender, Williams centers the puck. ROGER CHRISTIAN, having assumed a dangerous position in the slot, sweeps the puck at Puchkov’s goal with his first touch. Bill Christian’s second strike of the game gives the United States a 3-2 lead with 5:01 to go in the third period. The Soviets would make serious efforts to tie the score for the remainder of the contest. 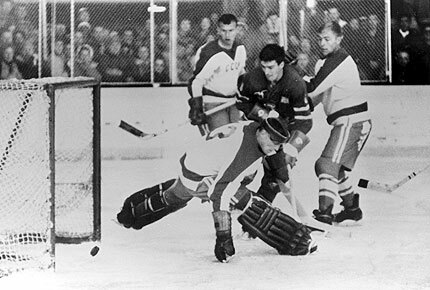 But former University of Minnesota goaltender JACK MCCARTAN, who had turned aside 38 shots in the United States’ 2-1 upset of Canada two days earlier, would not oblige. With the partisan crowd firmly behind him, McCartan finishes with twenty-five saves against the USSR. And, thus, the Soviet Union fall to the United States for the first time at a major international ice hockey tournament.